As we begin 2012 and emerge from the darkest time of the year in Western Alaska, we can't thank you enough for all you do for our mission. Your support continues to make an incredible difference. Storm after storm has been hammering our corner of the world. 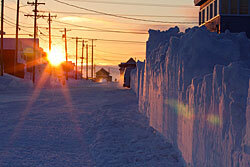 With many winter months still to come, the snow is piling up: sometimes to extreme heights, as you'll discover below. The consequences of the biggest storm in decades continue to reverberate; with Nome surrounded by Bering Sea ice, extraordinary measures are needed to complete the last fuel delivery of the season. Thanks to you, it's a story that we're following closely; you'll find more below. Amid these challenges, we remain thoroughly blessed with the people who support and uplift our communities and our mission itself. This month, we highlight the Alaskan clergymen who have contributed so much: whether in ministering to our listeners or in guiding our operations (usually, both). As we've written below, we have special reason to celebrate, as one of Nome's own has just been ordained a Catholic deacon! We're also happy to report that our long-term goal – expanding and converting our studios to modern, digital equipment – is very much within reach, thanks to your generosity. An update is below. 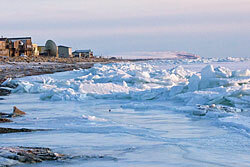 From all of us at KNOM, thank you for helping us to serve the people of Western Alaska throughout 2011. We're ready to do it again in 2012, and we're so grateful for your support. Our best wishes to you for a healthy and prosperous New Year! As we greet the New Year and conclude the Christmas season (which, in the Catholic liturgical calendar, ends with the Epiphany of the Lord on January 8th, 2012), we're excited to report that your generosity has allowed us to share with Western Alaska the joy of the holidays. 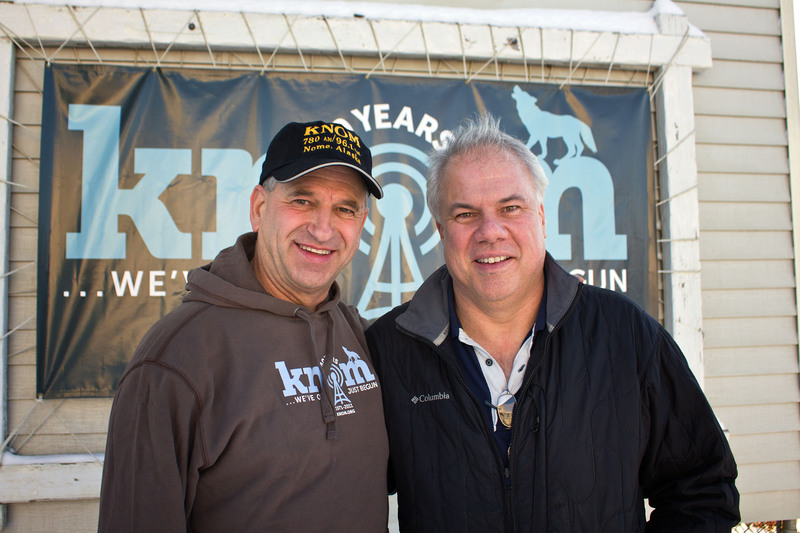 On December 23rd, KNOM hosted its annual Christmas Call-In Show, allowing listeners from across our region to send holiday greetings to friends and family spread across the 100,000 square miles of our AM listening range. The show is by far our longest call-in show of the year, with live greetings stretching from 10am to 5pm. It's a highlight of our seasonal programming and one of our most popular shows. 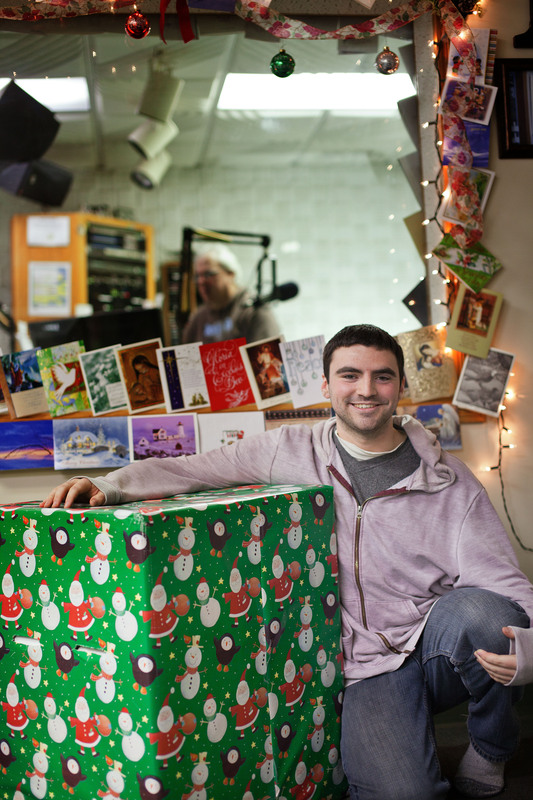 During KNOM's Morning Show the week prior, we also offered a very special giveaway prize: a large box of food, toys, clothing, and Christmas gifts, all of which were donated to KNOM specifically for our rural listeners. Volunteer Matty Guiffré coordinated the on-air contest and arranged for the box (pictured with Matty) to be flown via bush plane, free of charge, to the village of Wales, where our lucky listener, Josh, planned to share the box with his community. 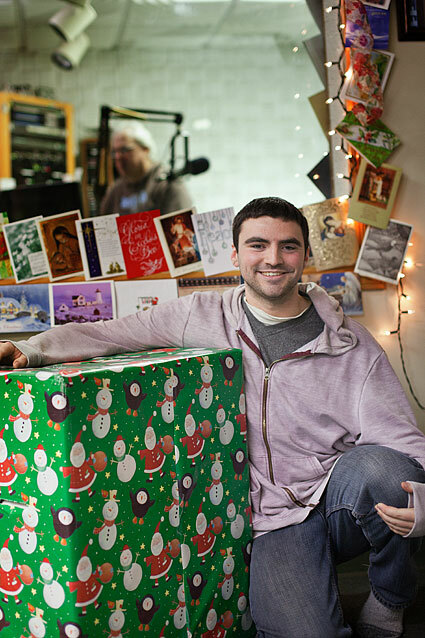 Thanks to your support, we "kept the season bright" this Christmas for our tens of thousands of rural Alaskan listeners. You made it possible! Make prayer your first response, not your last resort. KNOM Radio is sustained through so many people: generous supporters, loyal listeners, and deeply spiritual clergy, who continue to guide and bless our mission. In recent months, KNOM and Western Alaska have both welcomed and bid farewell to a number of such clergymen. 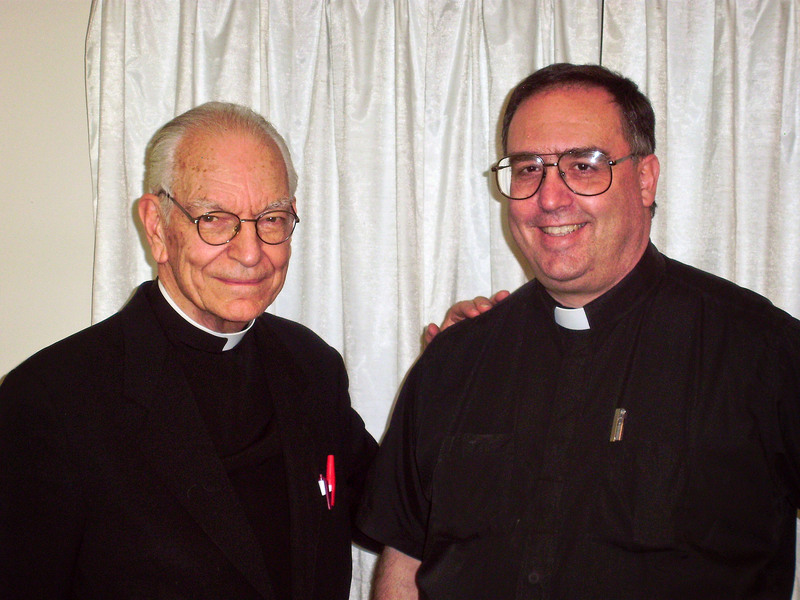 As you may have read in the December issue of the Static, one of KNOM's spiritual advisors, Father Vince Beuzer, passed away in October. Last month, we were saddened also with the passing of Cardinal John Patrick Foley, a national Catholic leader whose life work merged religious ministry and communications. For decades, Cardinal Foley narrated Christmas broadcasts of midnight Mass from the Vatican and served as President of the Pontifical Council for Social Communications. He believed – as we do – in the power of media to unite and inspire the faithful, and he will be missed. Amid last year's sorrow, however, KNOM's clerical friends brought us many occasions for joy. We were delighted to welcome back to our mission Father Mark Hoelsken, who, for many years, served as KNOM's spiritual advisor while also ministering to communities throughout southwestern Alaska. 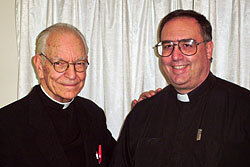 Father Mark, pictured at top with general manager Ric Schmidt (Fr. 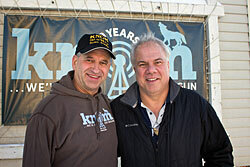 Mark at left) was – and still is – a beloved figure among both Western Alaskan listeners and the KNOM staff, and we were glad to greet him during his brief visit to Nome late last year. KNOM's spiritual advisor Father Armand Nigro and Father Ross Tozzi (pastor of Nome's St. Joseph Catholic Church) remain active. Both were recently in Fairbanks, Alaska for the photo at middle (generously provided by Betty Scott): Fr. Armand was leading a retreat, and Fr. 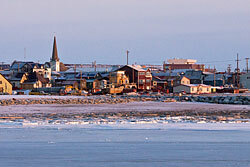 Ross was en route to the city of North Pole to dedicate a new pastoral center. Our joy goes also to Nome's Bob Froehle, who, in early November, was ordained a deacon! 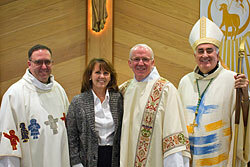 Bishop Donald Kettler officiated the ordination Mass before a large congregation at Nome's St. Joseph Catholic Church. 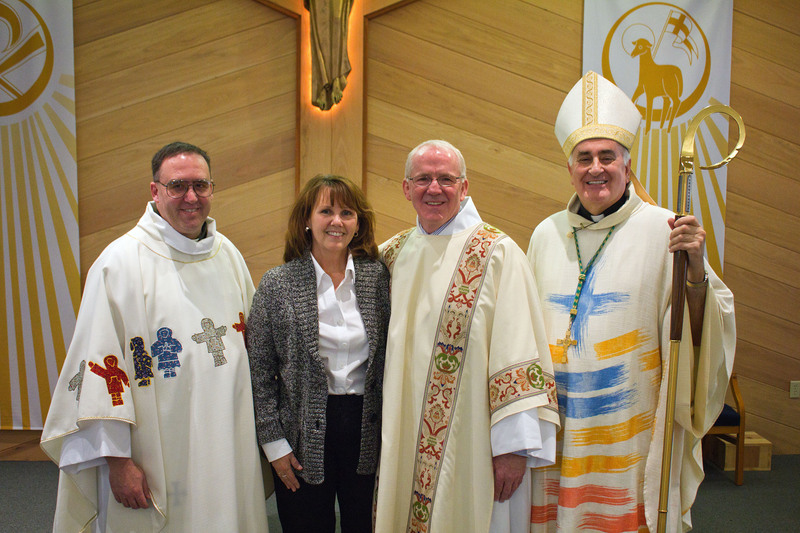 Pictured are (left to right): Father Ross Tozzi, Bob's wife Gretchen Froehle, Deacon Bob, and Bishop Don; this photo and many others were generously taken by volunteer Ben Matheson. Congratulations, Deacon Bob! If life gets too hard to stand… kneel. As we've said before, winters in the sub-Arctic can be rife with harsh weather, often presenting extra challenges in obtaining even the basic necessities for daily life. In the past few months, we've seen some extreme examples of such challenges, but through your support, we've not only endured them but, also, reported on them. You may have read (in our Christmas Static or even in national media sources) of the massive Bering Sea storm that brought hurricane-strength winds and almost unbelievably fierce waves to our region last November. Although we did not realize it at the time, the story of the storm was not over when the waves and winds receded. 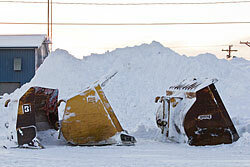 The November storm delayed the arrival of Nome's final fuel shipment, carried to town via an ocean barge. 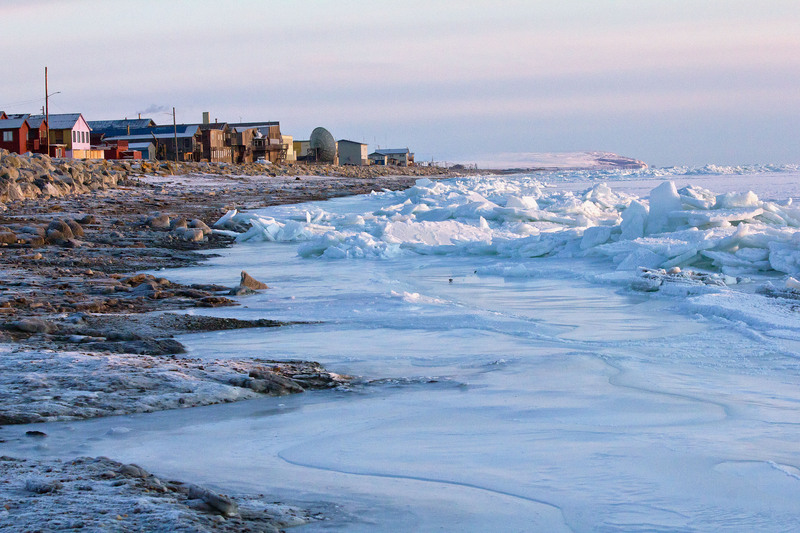 In the weeks after the storm, subzero temperatures returned and the Norton Sound waters surrounding Nome froze over, preventing the barge from arriving with its crucial supply of gas and diesel. 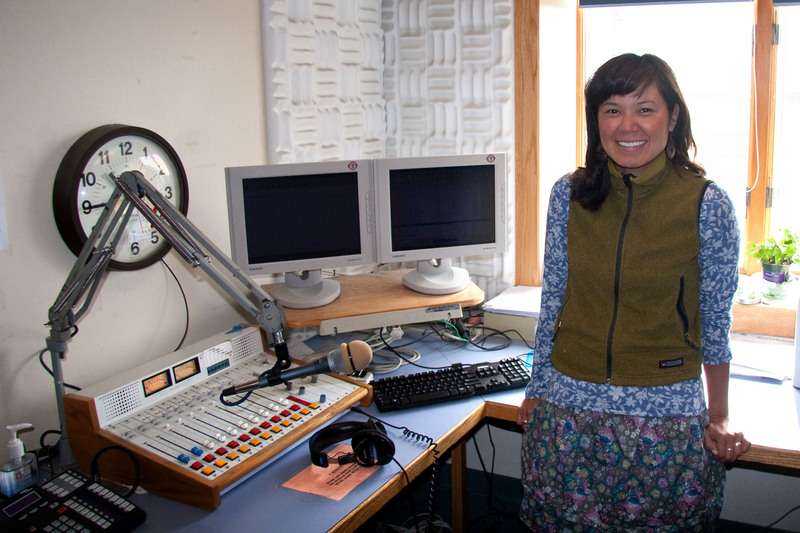 As town organizations scrambled to find a workable solution, the KNOM news department (led by news director Laureli Kinneen, pictured) went above and beyond to keep our listeners informed. As Western Alaskans heard on KNOM – and as many of our supporters may have read on our website (at knom.org/news) – all is not lost for Nome and its fuel shipment. While details are still evolving as this newsletter goes to press, it now seems that the Russian tanker Renda may make history by breaking through the Bering Sea ice to deliver Nome's fuel. It is not known how the delay of this shipment – or the extraordinary measures needed to finally accomplish it – may affect Nome's fuel prices. This ongoing story continues to attract interest around the world, and our "newsies" remain on the front lines. 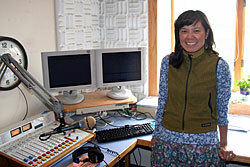 Thank you for making our reporting possible during this incredible moment for rural Alaska! Photos at middle and bottom: the shoreline surrounding Nome is now surrounded with Bering Sea ice (as it is for months at a time, every winter). It's this ice that's so complicated Nome's final fuel delivery. God gives us the ingredients for our daily bread, but He expects us to do the baking. 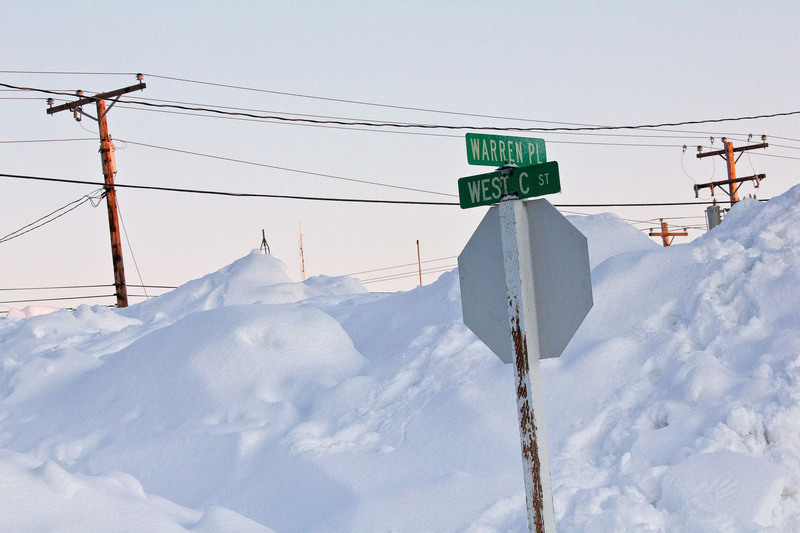 It's a question at the heart of daily life in our region, and we suspect it may intrigue you, as well: how much snow will Western Alaska get this winter? 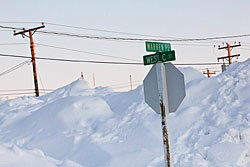 Although some readers may be surprised to know that our climate is often very dry – more notable for its subzero temperatures and fierce winds than its precipitation – when Nome does have a winter storm, the accumulation can be extreme. Temperatures rarely rise above freezing, which means that our snow cover continues to deepen throughout the season. In the span of a week this past December, Western Alaska experienced three distinct blizzards, dumping multiple feet of snow on our communities. As seen in the photos at right, Nome's snow accumulation – especially after it's been cleared from the streets – can easily exceed the tops of automobiles, street signs, and even the massive metal scoops used to plow it. 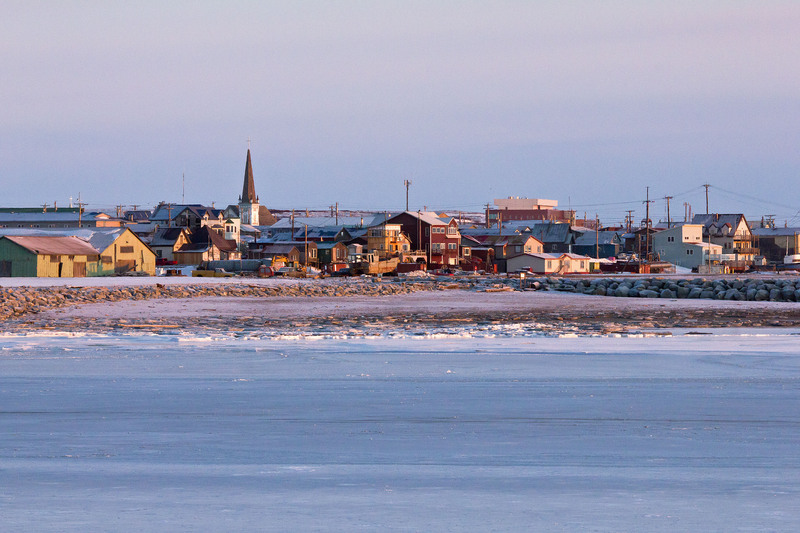 Storms of this magnitude often prevent transportation by airplane, which means that our isolated communities – including Nome – can't receive mail, groceries, or any other needed supplies. As we detail above, such storms occasionally create even greater headaches, and as always, KNOM's weather forecasts warn our listeners of any physical dangers or hazards they may face. These weather broadcasts – like everything we do – are made possible because of you. Life is very fragile. Handle with prayer. We close with an update on the Tom Busch Memorial Fund, dedicated to the future expansion and digital conversion of our studio facilities. Thanks to you, the fund now stands just shy of $150,000: a quarter of what will be needed for the new studios' construction. We're on our way!